Well well well what do we have here? It looks a little like a title where you can find the remaining members of the Fantastic Four all under one roof so to speak. 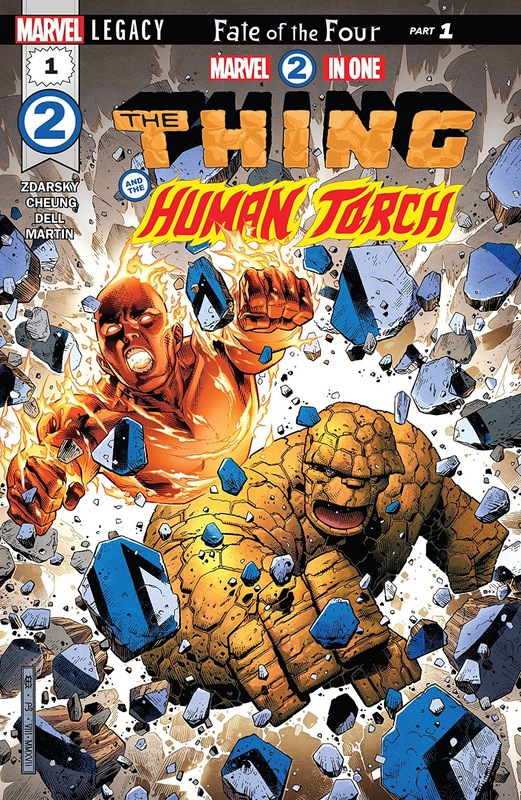 I’ll be honest I initially thought the series, when it was announced, based on the title alone, would provide us with two stories in each issue. So I was mildly disappointed this wasn't the case upon further research, and the title instead is referring to two characters featured in the book, but I the contents inside healed my wounds by issues end. 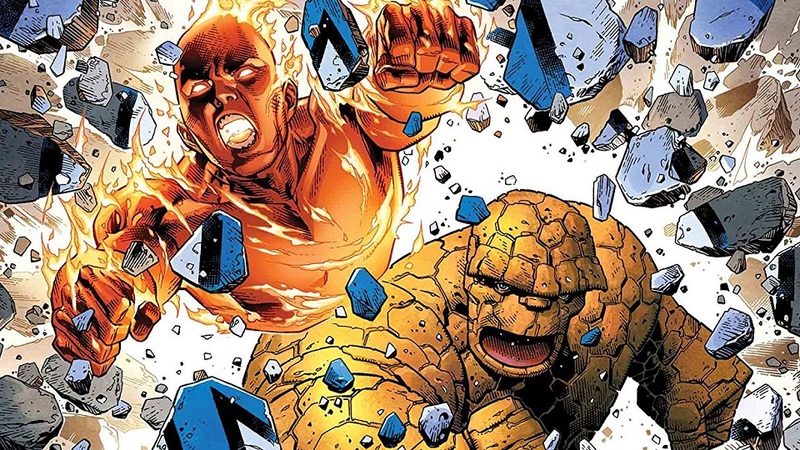 So let’s check out exactly what purpose these guys (Thing & Johnny Storm) are serving now that they’re no longer relegated to just guest star status in other characters books. The issue beings at Gibson Speedway with Johnny Storm in a race and accelerating like hell to get to first place.He pushes the car too hard and crashes bursting into flames, but Johnny walks out unharmed like a boss. 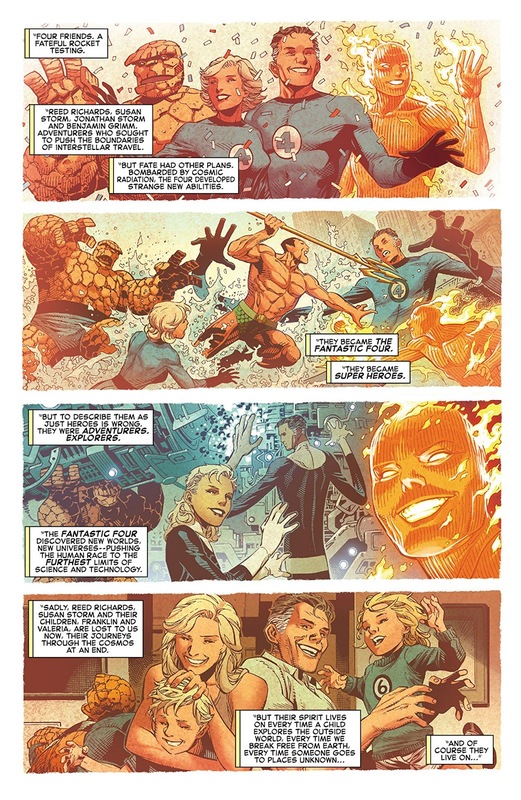 Next, we join Ben Grimm being introduced to make a speech at the Fantastic Award ceremony being held. Ben completes his duties, walking out for some fresh air, where he chats up a lady fed up with her company as well, before bumping into Spidey who’s fighting a jewel thief that the Thing ends up quickly taking care of. Spidey and Ben chat for a moment and Spidey, who’s seen a lot of Johnny in his Spectacular title, let Ben in on a few things. Mainly that he thinks Johnny is being way more reckless, dark, and broody than usual. Spidey, in a very heartfelt moment, also hands over the keys to a storage facility for the contents of the Baxter building to Thing. Thing takes the keys and visits the warehouse while thinking back to some memories shared with Sue and promises he made. Thing is interrupted and surprised by none other than Doom and after a long verbal and physical exchange with Thing eventually turns over his ‘inheritance’. Mostly because Doom cant opens though and not for a lack of trying. When Doom ‘leaves’ Thing opens the orb that is his inheritance which turns out to be a hologram of Reed. Reed through a peep talk inspires Thing to continue the exploration aspect of the team while leading him to the Multisect, a tool that can access an area known as the Multiplane, a roadway to infinite universes. Checking back in on Johnny he appears to be repeatedly free falling from Space to Earth when he conveniently runs into Thing. 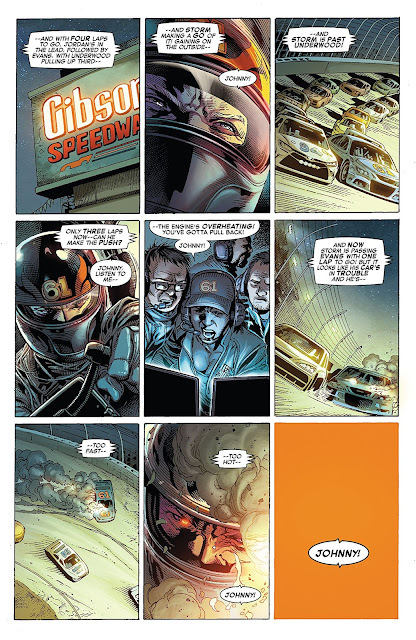 Johnny reveals he’s still having trouble dealing with the loss of his Sister, Reed, nephew, and niece breaks down while also revealing to Thing he’s losing his powers. Thing wraps up the reveals stating he believes they may still be alive and of course Doom is watching everyone this whole time. Overall, I have been a pretty big skeptic of Chip Zdarsky and his efforts at Marvel so far mostly with Spectacular Spider-Man, which I'm not a fan of. However, I can confidently state I love this issue without question. From the brief bits of action to the character work, and classic Fantastic Four feels, he really goes above and beyond with his efforts here, and this title has quickly grabbed my attention as a Marvel Comics must follow. Treat yourself to a Marvel Holiday treat and read this book. The art looks amazing as well but I would have preferred a little brighter color palette personally. This, however, is a minor complaint in the scheme of things and doesn't affect my enjoyment level at all. While the Marvel Legacy lineup as a whole has been a bit hit and miss to me this may be the book above all I recommended everyone check out. The story, characters, cameos, and art all combine to make this an instant hit with that classic Fantastic Four feel. This was a real good issue. 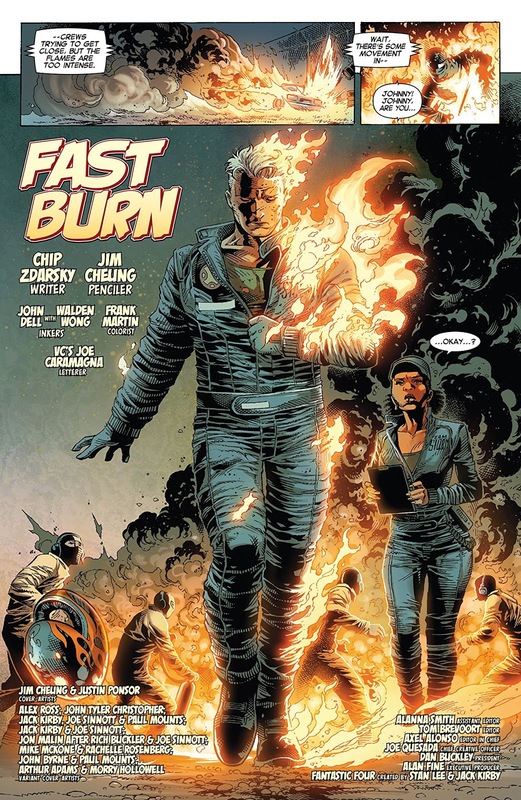 I had my doubts also about Chip but with this issue he allowed the art to breathe and tell most of the story in a very impressive way.